Know this: Social media is important. Now that this has been established we can begin our conversation. This is the first of what I hope will become a series of helpful hints, tricks, and thoughts all pertaining to social media and marketing. Proper social media practices can often lead to unparalleled exposure. For many in the marketing world social media is the key to their successes and the cause of their failures. Up first is something that is happening more and more and for many is a real problem: Cross-Posting. So, what does cross-posting mean? In terms of this conversation we are talking about linking together social media accounts from different platforms. We've all seen it before, a Facebook post that says it came from a post on a Twitter account. At first glance it might not seem like a big deal to you, but for many it screams LAZY. We can apply some simple logic to this thought. If posting on social media is important enough for your business to make it a part its day then why is it not important enough to do it right? Twitter restricts your characters meaning that your best Twitter post is exactly that... your best Twitter post and nothing more. In fact, posting your character restricted post to Facebook is really putting unnecessary restrictions on your message. Facebook allows you to tell a story but because you've cut corners you are missing out on that opportunity. Ben Donkor puts it best in this Link Humans blog, "Negative perception: the general perception from people who might catch you cross-posting is “that’s just plain lazy” – and they have a point... Cross-posting may appear as a convenient, quick and easy way to save time posting, but if you care about your fans and followers, you should take those extra 5 seconds to tailor your message to not only the platform you’re posting to but your audience too." Feeling bad about the lazy comments? Don't be. However, that's not the only reason to avoid cross-posting. As stated earlier, each platform has its own restrictions and features. In fact, when posting a picture for marketing purposes you should never consider cross-posting because they all have different preferred image sizes. Yes, there are some images that will work on both but none of them are ever ideal. You've taken the time to take a picture and clean it up digitally, now make sure it is presented to your audience as best as your chosen social media platform will allow. I hesitate to mention these numbers because they change a lot but: Twitter images post at a 2:1 ration while Facebook is closer to 1.9:1 and Instagram is a square 1:1. Why not make sure your message is designed for your post? With that in mind, you can design images that will work for all three but a large majority of the cross-posters are not doing that. In addition to image sizes and character limits, there is one major difference between the platforms... the audience. Let's use Facebook and Instagram for this part of the discussion. For this fictitious post we are going to talk attempt to get the social media users to read our blog about the benefits of snow tires. "Driving in snow is stressful enough, so why would anyone make it more difficult by choosing the wrong tires? Luckily, Mechanic Bill says snow tires can be cheaper than you think. #carlife"
"Amazing to look at. Difficult to traverse. #snow #cars"
Can you see how both posts can be about snow tires but both speak to a different audience? 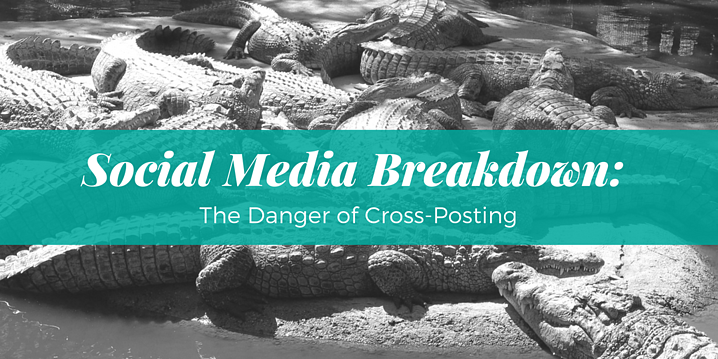 CBD Marketing has a great article on the varying audiences of social media platforms and how cross-posting can damage your message. Okay, I could go on forever. I could talk about how in some cases cross-posting is acceptable if your goal is to use one platform to promote the other but most of the posts I see are not done for that purpose. So, for now I'll leave things here. Feel free to fill out the form below with comments or questions. Happy posting!